wow mais um lindo desenho! você desenhou eles super bem! ela ficou lindona! e as cores ficaram ótimas! belo trabalho! 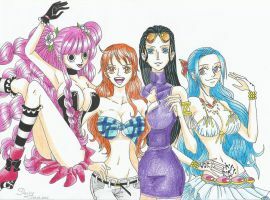 Do you watch/read One Piece? You're welcome and no I don't read one peace I'm not a big fan. ahh ok, I highly recommend it. Yeah it got me because it has the little barrel on its neck like the dogs from the cartoons. Haha this is really great! One question, It continues the comics, ehm the The Secrets of Mobius - Season 1??? yes, I will. The next page is done, just put the dialogues. Oh it's okay, I understand. It's cool, your comic is sooo cool and really interesante! I like it so much Sonic comic, obviously those who make these comics! But anyway, I can not wait to see him, of course, take your time you have the time of your own! Not gonna lie, but Vivi and Carue are two of my favorite characters next to the Straw Hat Pirates.